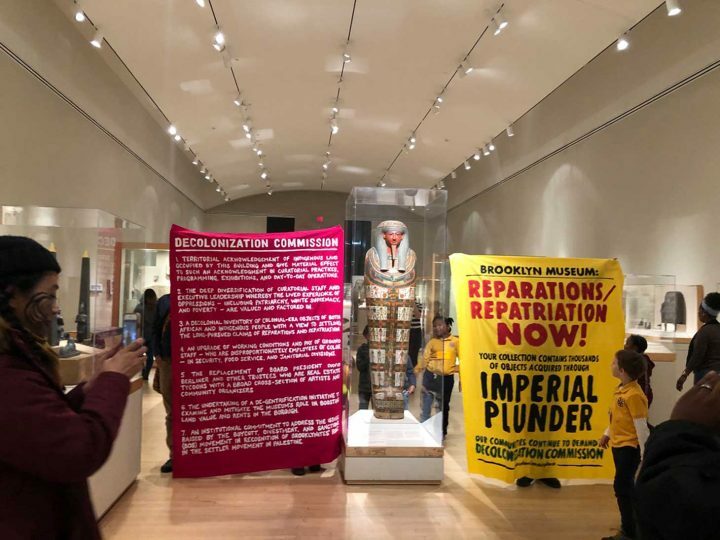 Parallel to today’s protest at the RISD Museum, organizers from Decolonize This Place gathered at the Brooklyn Museum to decry stolen objects in the Brooklyn Museum’s collection. 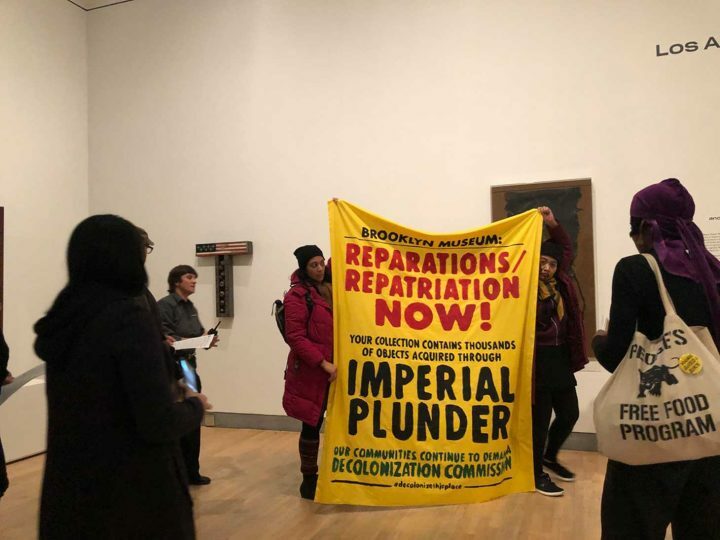 Simultaneous to today’s protest at the RISD Museum, activists from Decolonize This Place gathered at the Brooklyn Museum to protest the objects in the museum’s collection acquired by past imperial conquest. 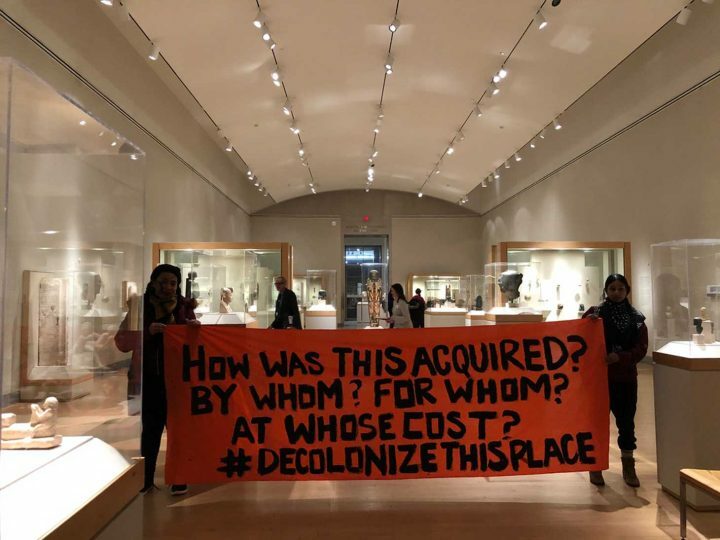 The organization has protested at the museum on numerous occasions, adamant that its administration establish a “Decolonization Commission.” An organizer with Decolonize This Place, Amin, said as the activists prepared to enter the museum, “This action, in a way, is a reminder to the museum. It lays out what the museum has yet to respond to, which is why we’re here.” He explained, “This is about us being present and delivering a message. It’s really not a protest.” Amin called the banners they had prepared an extension of the shows on display, saying they were art in conversation with the exhibitions. The group first entered the museum’s top floor, the entryway to the expansive and well-received exhibition Soul of a Nation: Art in the Age of Black Power. They began the action by unfolding their first banner in a room of assemblage works by artists including Betye Saar and Noah Purifoy. Organizers gathered in a circle and began reading their day’s mission from the handout and offering their own testimonials. An early Friday afternoon, there were a number of school groups meandering throughout the galleries. 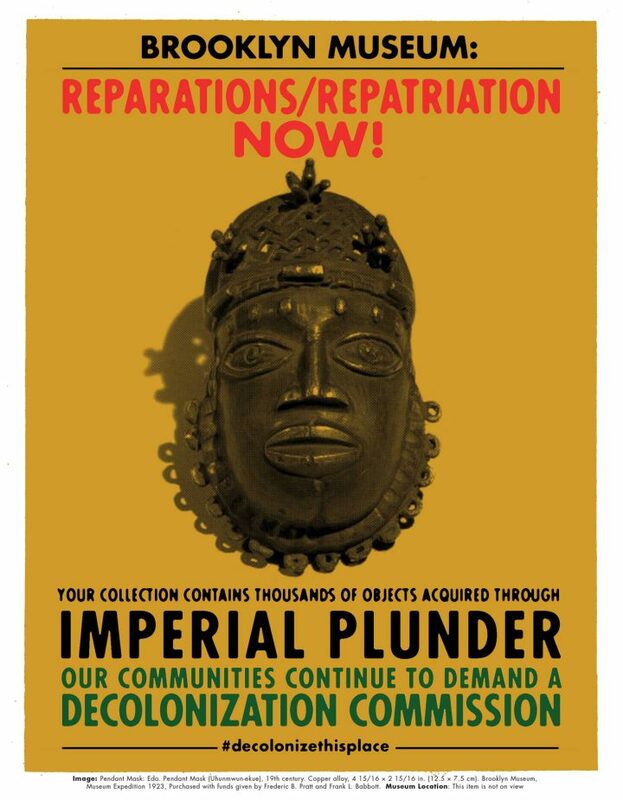 “Colonial plunder is a perfect example of the misuse and disrespect of artworks,” one Decolonize This Place member explained to the group in their quiet discussion. Initially, gallery security seemed confused, but soon after, senior security staffers entered the gallery to confront the collective. They asked the banners to be folded and taken out of the gallery and said they required permission from the museum to move forward with an action of this manner. “This is completely not related to what we have here,” one guard said. A visitor services employee arrived, and the organizers and staffers continued to debate. As they did, patrons asked members to see copies of their flyer. Arguing the banners were art, the protesters held the banner against one participant’s back, to the disdain of museum security, and walked toward the front of the gallery to exit. A visitor services staff member escorted Amin downstairs to discuss the museum’s regulations for hosting protests. The group walked through the remainder of the Soul of a Nation exhibition. When they entered the third-floor exhibition of Egyptian artifacts, they began to unfold their banners once again, but after a longer stretch of time than their initial attempt, five security personnel entered the gallery and asked them to desist. They exited the museum, handing out flyers on the way, in the café and throughout the lobby. Amin returned from his discussion with visitor services just as they were being asked to fold up their banners once again. He told Hyperallergic that he met with two visitor services staff members, who, “communicated how they’re supportive and it’s an uncomfortable position.” He says they tried to contact Brooklyn Museum administration but were unable, instead forwarding them a letter from Decolonize This Place. Hyperallergic has not yet received a response from the Brooklyn Museum.